If you’re a fan of Marvel Comics you’ll probably recognize this concept right away. 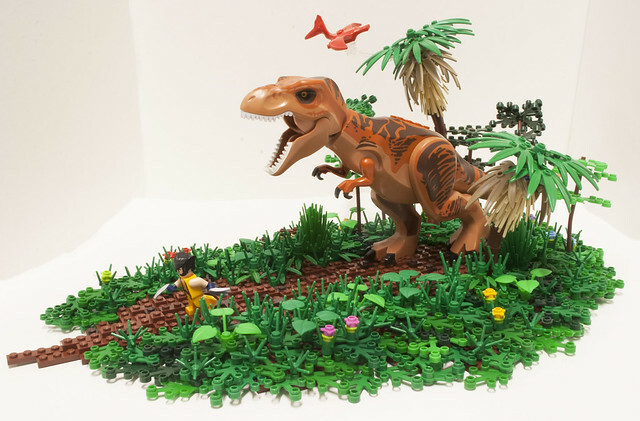 Even if you’re not, this MOC has dinosaurs AND super heroes. What more could you want? The Savage Land is closely tied to the X-men and I believe it popped up in the first few issues back in the 60’s. It’s been in or referenced in just about every Marvel comic and property since then. I loved the Savage Land story line in the 90’s X-Men cartoon series and the older Spider-Man & His Amazing Friends series and I’d recommend watching either for kicks. The X-Men serial in particular if you like a Magneto/Professor X team-up. I love the thick brush and tall foliage in Ben’s build and one thing’s for sure, healing factor or not, this is gonna hurt! As cool as the dinosaur is, the foliage adds a lot to this. I love seeing Lego foliage used to good effect!